The Multimedia future is ready to use. High brilliance, high contrast, extensive focal distance, perfect convergence at all times: the new digital projector SELECO SDV 2200 is the answer to the most advanced requirements in the field of wide screen image projection. Easy installation makes it the ideal tool for large venues, conferences and exhibitions. The quality of its image, obtained also from the Digital Light Processing (DLP) technology by Texas Instruments, makes SDV projectors leaders in the newest entertainment revolution: the electronic cinema, but even the Hi-End Home Theater. 3 Digital Micromirror Device (DMD) by Texas Instruments (chips each covered by hundreds of thousands of micromirrors) are used in the SDV projectors. They provide unbeatable brilliance via the reflection of a powerful lamp. The result is a brilliance unrivalled by liquid crystal projectors and a particularly clear image due to the virtual absence of pixelisation. 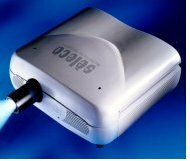 SELECO SDV 2200 digital projectors are characterized by both their amazing versatility and ease of set-up and operation, features which make them leaders on large venue products. The inputs can be customized according to each user's requirements by simply modifying the Electronic Processing Box (EPB) configuration. In fact, a wide range of input modules permits connection of the projector to video sources, computers and other up-to-date peripherals such as DVD. Perfectly compatible with the world of Information Technology, the SDV digital projectors can display images taken directly from computers with extremely high resolutions, on wide screens of up to 500" diagonal. All this comes with a superb video quality achieved through Colorimetry DMD Processing. The XGA DLP projector SELECO SDV 2200 boasts a computer resolution compatibility up to 1600 x 1200 pixels and an impressive brightness of 2200 ANSI lumens, ideal where top performances are required (electronic cinema, virtual reality equipments, large congress rooms, etc.). Remote control: both infrared and cable, backlit remote control with shortcut buttons to main functions; a simplified user remote control is also provided.